Connect your corporate offices to the Internet using our advanced Optus Evolve® network. 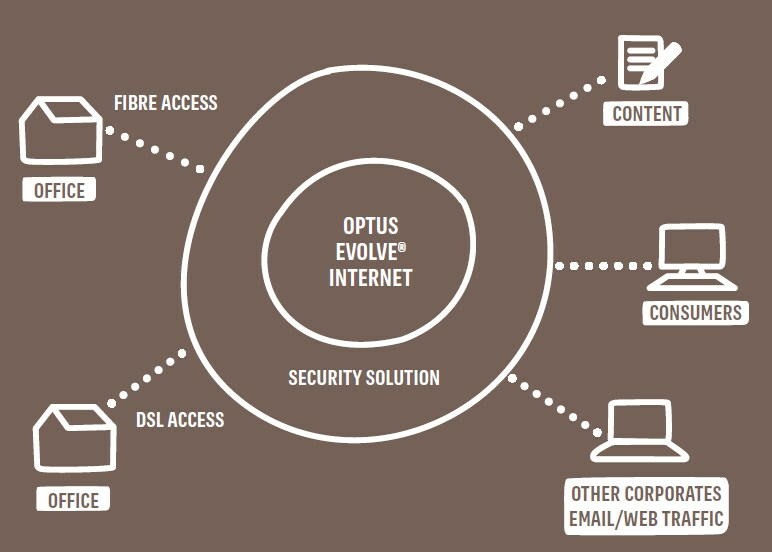 If you're looking for fast, reliable Internet connectivity for your sites, Optus Evolve Internet is a comprehensive package designed for organisations of all sizes. You can choose access, bandwidth, service type, billing, reporting and other features to tailor the solution to your business needs. Optus Evolve Internet integrates seamlessly with other components of the Optus Evolve® communications suite to deliver a total communications solutions for your business and a robust platform for deployment of converged business applications. 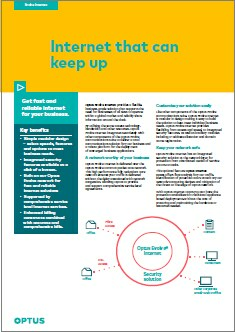 Optus Evolve Internet provides reliable, flexible, scalable and cost effective Internet connectivity to keep your business moving. Range of ancillary services available such as IP address allocation and Domain name registration. Single online reporting platform provides vital statistics to monitor performance. Utilises the Optus Evolve network for fast and reliable business-grade Internet services. Integrated Security - Optional add-on security application to protect against Distributed Denial of Service (DDoS) attacks so you don't have to deploy your own premise-based solution. Complete corporate solution - Designed for organisations of all sizes, you can select speeds, features and options to meet your business needs. Fast and reliable - Delivered over Optus Evolve network, which is supported by comprehensive service level agreements. Simple Upgrades - Based on Optus Evolve's modular design, it's simple to add sites, upgrade bandwidth or increase subscriptions as your needs change. To find out more about how Optus Evolve can help your business, contact your Optus Business Account Manager. 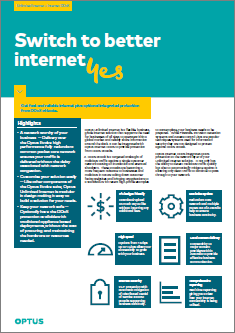 Optus Evolve Internet is designed around the modular framework developed for the Optus Evolve communications suite, Optus' new generation national IP network. Optus Evolve Internet offers a variety of options, including bundled or unbundled services, usage-based billing and reporting, along with standard features such as email store and forward. It supports a range of accesses, including ADSL / ADSL2+, SHDSL, direct fibre and leased line, all of which provide Ethernet termination to your sites. Optus Evolve is a nationwide service and can be connected internationally. Online reporting is provided through a single portal, eCare. What are the Optus Evolve Internet pricing options available? Flat rate - A recurring charge based on access speed and all Internet usage. Subscription - A minimum subscribed amount of data is charged and any excess usage is charged per megabyte. Usage - A recurring charge based on access speed and any usage is charged per megabyte. Aggregated Billing - A recurring charge where usage from multiple sites is aggregated into a single plan. Monthly usage can be viewed on eCare. How do I access the ecare portal? Click here to access Optus eCare online reporting and management portal. Get fast and reliable internet for your business. Get fast and reliable internet plus optional integrated protection from DDoS attacks. Smart business needs a smart network. How software defined networking will transform Telco services. Explore how networks deliver value in an increasingly digital world. Transition to NBN with Optus Business.